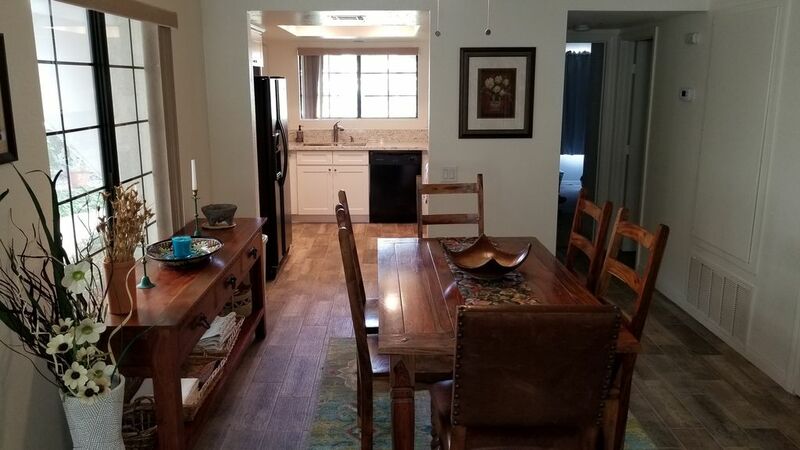 This ground level condo with 2 bedrooms & 2 baths is newly upgraded and remodeled. Enjoy views of mountains, relax and sun at the pools, or play a game of tennis or round of golf. This condo will definitely not disappoint! Cable TV, WIFI, unlimited calling to US and Canada, washer/dryer in patio closet, propane barbeque. Pool, Spa, Golf, Clubhouse, and Tennis, with gated community. Conveniently located near shopping, restaurants and theaters in central Palm Springs. We were pleased with the unit. The facility was well maintained. Unit could have been cleaner, especially the floors. We also had a bug problem, the owners promptly had an exterminator address the issue. Great Condo, Great Location and Great owner. Don and Julia were a pleasure to host and the most professional guests we have had to date. They are welcome any time. Susan and Matt have been wonderful hosts, the house is incredibly clean, elegantly decorated, as well as peaceful and comfy. Highly recommended!! There's a lovely pool, beautiful view of the mountains and just a general air of calm and relaxation. Go for it!